AMD has today given us an update on their processor line-up and roadmap for 2016, launching a couple of new and improved stock coolers as well as a handful of new CPUs and APUs. 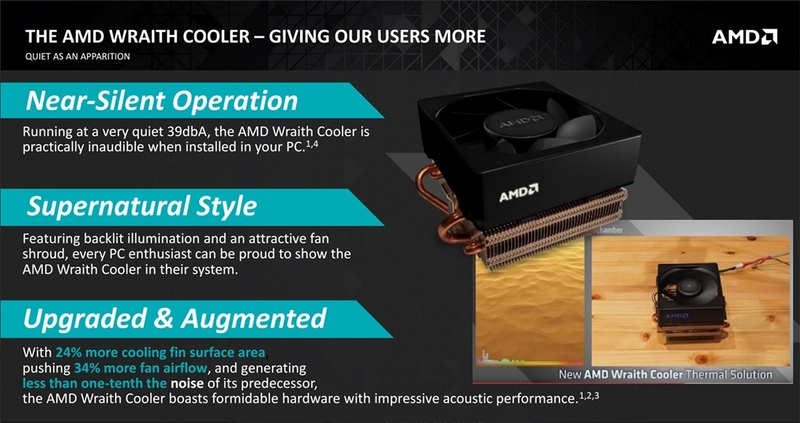 The Wraith Cooler is the biggest announcement to come from AMD today. This new cooler will be bundled with a selection of high-performance FX CPUs, replacing the previous design and delivering better thermal and acoustic performance. AMD states the Wraith runs at a "practically inaudible" 39dbA, while delivering 34% more airflow and 24% more cooling fin surface area than its predecessor. The FX 8370, an aging 32nm 125W CPU with eight cores clocked at 4.0 GHz, will be the first product from AMD to be bundled with the Wraith. The new cooler will not increase the price of the product, meaning it should be available from retailers such as Newegg soon for the same $209.99. The other cooler AMD has launched is the "new AMD 95W Quiet Thermal Solution", an improvement on the old cooler that came with 95W CPUs. AMD claims this cooler has the same near-silent design as the Wraith cooler, although it's smaller and doesn't provide as great cooling performance. It will be bundled with some new AMD processors. As for new processors, AMD has announced three new SKUs that slot into their existing A-series APU and Athlon CPU lines. The A10-7860K is the first of these chips, slotting comfortably between the A10-7870K and A8-7670K with four 'Steamroller' cores clocked at up to 4.0 GHz, and eight GCN 1.2 GPU cores clocked up to 757 MHz in a 65W, 28nm package. On the lower end of the spectrum, the A6-7470K rounds out AMD's current APU line-up with two 'Steamroller' CPU cores clocked at up to 4.0 GHz alongside four GCN GPU cores at 800 MHz in a 65W package. And finally, for those that want a similar product without integrated graphics, AMD will offer the Athlon X4 845 with four newer 'Excavator' cores clocked up to 3.8 GHz in a 65W package. Both the new A-series and Athlon products use AMD's FM2+ platform, which along with the performance AM3+ platform are getting new motherboards that support all new features. Companies including Gigabyte, MSI, Asus and ASRock are already shipping new boards for these sockets with features such as USB 3.1, USB Type-C, and M.2, with more products to come. Lastly, AMD has announced new gaming platforms that "provide capable performance and excellent value" for gamers and system builders. The first is a high performance system capable of "beyond 1080p" gaming for around $560 in key components, comprising of the Radeon R9 380X, an FX-8370, and a 990FX motherboard. AMD's mainstream gaming platform combines an R7 360, Athlon X4 870K and an A88X motherboard for $265, while their entry-level system is just $150 in key parts, using an A10-7860K and an A68H motherboard. It should be noted that these prices are for just the CPU, GPU and motherboard: adding other key parts such as PSU, RAM, case and storage will increase the overall system cost.